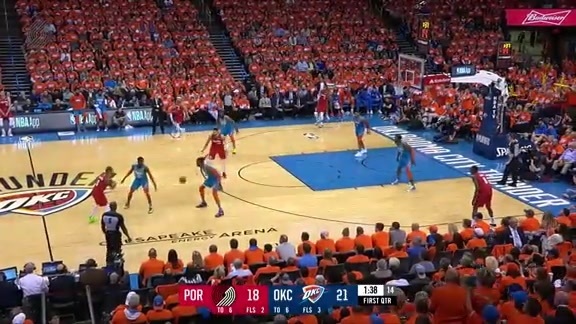 After entering Game One Sunday afternoon with a 10-game playoff losing streak, the Trail Blazers bested the Oklahoma City Thunder 104-99 in front of a sellout crowd of 19,886 in Game One of the three-six matchup of the 2019 Western Conference Playoffs. "Obviously it's good to get the first one here at home," said Trail Blazers head coach Terry Stotts. "I thought it was a really hard-fought game. Very competitive." The Trail Blazers now lead the series 1-0 with Game Two scheduled for Tuesday at the Moda Center. “Last year we didn’t win a game, this year we did," said Damian Lillard. "We’ve gone two playoffs without winning a game so obviously it’s a good feeling to get back on the winning side. It’s only one game. That’s all it is. We know how it feels to win a game and now we can just kind of move on from that and stay focused on this series." Portland got off to a dream start Sunday afternoon, shooting 12-of-20 from the field and 7-of-10 from three on the way to scoring 39 points in the first quarter. Combine that with holding the Thunder to 35 percent shooting from the field and 0-of-6 from three, the Trail Blazers were able to go up by as many as 17 points before taking a 39-25 advantage into the second quarter. But while Portland held continued to hold Oklahoma City in check offensively, their wildly accurate shooting in the first quarter came back to the percentages in the second. 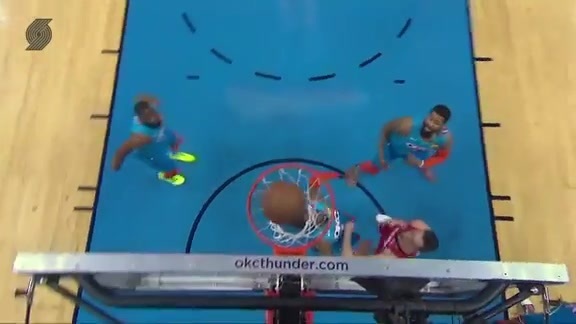 To make matters worse, Portland turned the ball over eight times in the second quarter alone, resulting in the Thunder closing the half strong by cutting the lead to 54-48. "Forty-eight minutes is a long time," said Stotts. "The fact that we lost a big lead early in the game, you almost anticipate that in the NBA." But while the Thunder threatened to take the lead time and time again in the second half, including cutting the Trail Blazers' advantage to 93-92 after a Paul George three-pointer with 2:44 to play in regulation, the home team always made a play to hold on. Whether it was a Damian Lillard three-pointer, an Enes Kanter offensive rebound or a Al-Farouq Aminu grabbing a rebound and then making two free throws on the other end, the Blazers came through when it mattered the most. Portland was led by Lillard, who went 9-of-21 from the field, 5-of-11 from three and 7-of-8 from the free throw line to with four rebounds, four assists and three steals in just under 39 minutes. Lillard has now scored at least 30 points in 11 playoff games. CJ McCollum went 9-of-24 from the field for 24 points, six rebounds and three assists in 37 minutes. Enes Kanter, facing his former team, put up a double-double of 20 points on 8-of-15 shooting and a playoff-career best of 18 rebounds while also blocking two shots in 34 minutes. He became just the third player in franchise history, joining Bill Walton and LaMarcus Aldridge, to scored at least 20 points and 18 rebounds in a playoff game. Al-Farouq Aminu finished with 10 points, seven rebounds and three blocks while also making multiple hustle plays late in the game. Seth Curry came off the bench to score 8 points. Paul George and Russell Westbrook combined for 50 points for the Thunder. Steven Adams added 17 points and nine rebounds in 36 minutes. • The Trail Blazers lead the Thunder, 1-0, in their best-of-seven First Round series. • Portland shot 11-of-25 from the three-point line (44.0%) while the Thunder shot 5-of-33 from deep (15.2%). • The Trail Blazers recorded nine blocks to Oklahoma City’s four, while the Thunder had 10 steals to Portland’s eight. • Portland scored 39 points in the first quarter on 12-of-20 shooting (7-10 3-PT, 8-10 FT) to take a 39-25 lead. • Oklahoma City outrebounded Portland, 49-48, and won the battle on the offensive glass, 18-13. After playing their first 12:30 p.m. Portland start in Game One, the Trail Blazers and Thunder meet in the night game in Game Two Tuesday night. Tipoff is scheduled for 7:30 p.m. on NBC Sports Northwest and TNT.